So I’m 3 months in and still loving the Keto lifestyle. My energy is still great, cravings at bay, digestion on par and hormonal imbalances seems to be trending in the right direction (planning to get some testing done soon to confirm). Win-win-win. I feel really in tune with my body and I’m happy that things seems to be jiving! Saturday mornings in my house are for pancakes! My former go-to pancake recipe uses oats as the base. They are super yummy and I still make them for my family. However, I was on the hunt for a lower carb option that I could enjoy while Keto. I first tried a packaged product: Lakanto Low Carb-High Protein Pancake & Waffle Mix. 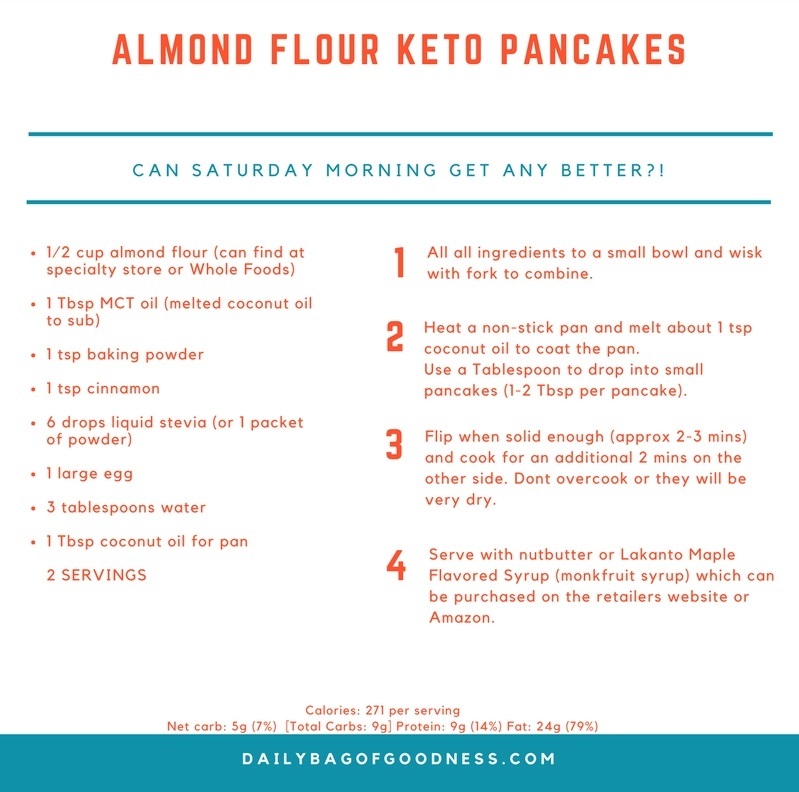 Its a great mix, and the pancakes cooked up well, but I’ve been trying to stay grain free (these are gluten free but not grain free) and so I went on a quest to create my own “keto pancake”. This one is super simple and very quick to throw together (just as quick as a mix actually). I usually top with some coconut butter, almond butter and/or a drizzle of the Lakanto Maple Flavored Syrup. I dont make any money promoting Lakanto products, but I do enjoy them and they are very Keto friendly. I hope you enjoy these pancakes as much as I do. I usually serve them up with a side of sugar free, preservative free bacon! Yumm! The perks of being Keto! These pancakes are very tasty!!! They also taste great topped with some fresh fruit!! Thanks Jamie for getting this one down to a science and sharing! I just made your oat pancake recipe yesterday because Saturday morning tends to be pancake morning in the Klingensmith’s house too!!! Yeah! Glad you are enjoying them as much as I do! Maybe I need to post the oat recipe too! !